How easy is it to experience Te Aranui o Pōneke by mobility scooter? Mobility advocate Neil Newman set out to explore the GHW from Scorching Bay to the Wellington Waterfront. One problem is the Miramar peninsula road, which from Scorching Bay to the Miramar Cutting has little or no shoulder or footpath. A mobility scooter user feels vulnerable riding on this narrow road, so instead Neil headed south from Scorching Bay to the Seatoun Tunnel and through Strathmore and Miramar to rejoin the GHW at the Miramar Cutting. 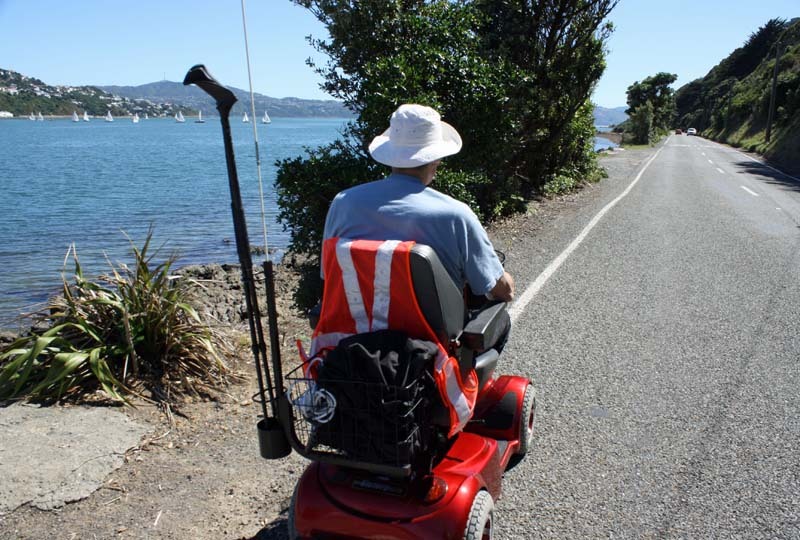 While there is an adequate footpath through Karaka Bay, it is narrow, and sometimes blocked by vegetation and parked cars. 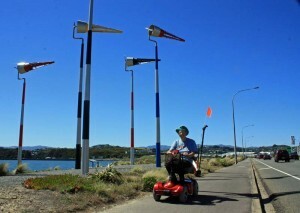 The East-West ferry provides a connection between the city, Day’s Bay, and Seatoun, but the wharf at Seatoun has a barrier that would need to be modified to be used by a mobility scooter. 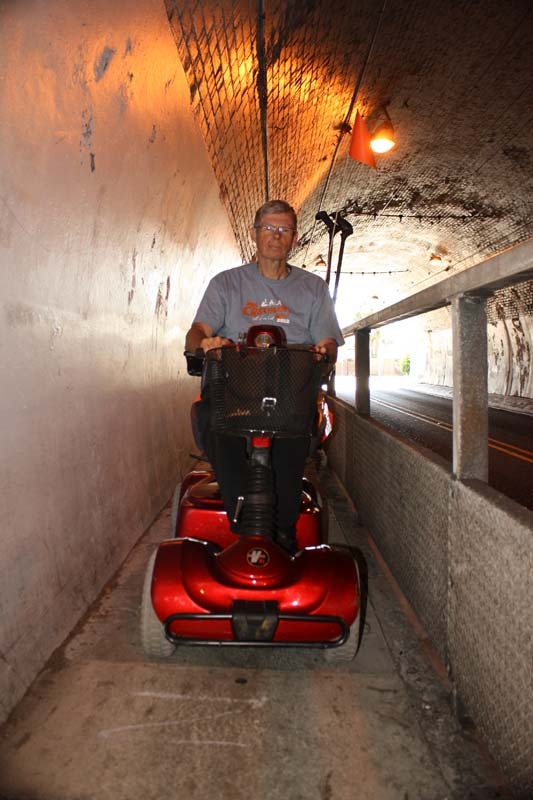 The Seatoun tunnel footpath is barely wide enough for a mobility scooter, a challenge when meeting runners and dog walkers coming in the other direction. 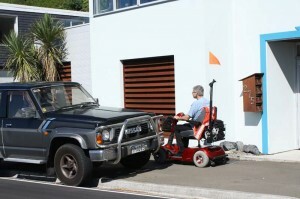 Back on the GHW on Cobham Drive, the shared path is fine for a mobility scooter, and passing joggers are prepared to give a push on slopes that challenge ailing batteries. The Wellington Waterfront is mobility friendly – walkers, cyclists and mobility scooters can coexist with minimal problems. 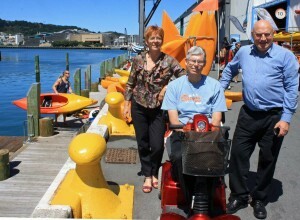 At Queen’s Wharf, Neil met Mayor Celia Wade-Brown and Councillor Bryan Pepperell. 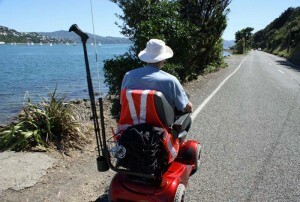 Neil estimates there are at least 400 active mobility scooter users in the Wellington area. 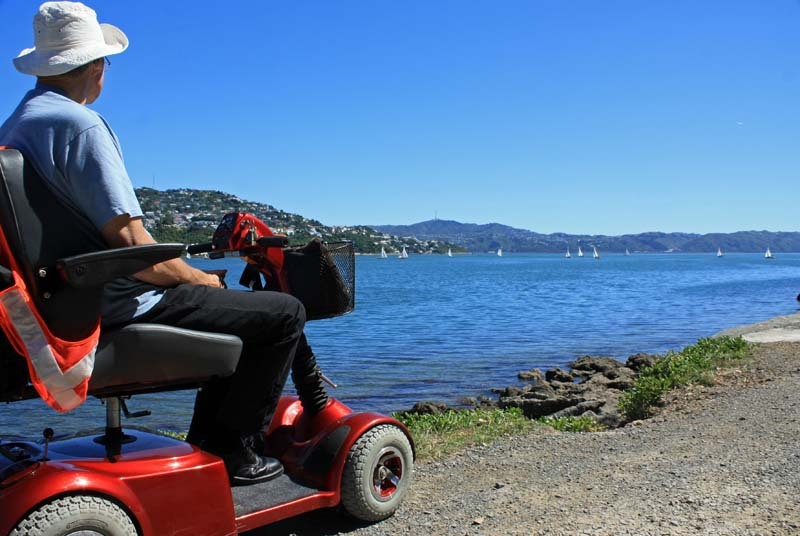 “Mobility scooters are not just for old people” – the Great Harbour Way/ Te Aranui o Pōneke is a “great opportunity” for mobility scooter users to explore their environment. Thanks to Alan of Mobility Centre for logistical advice. 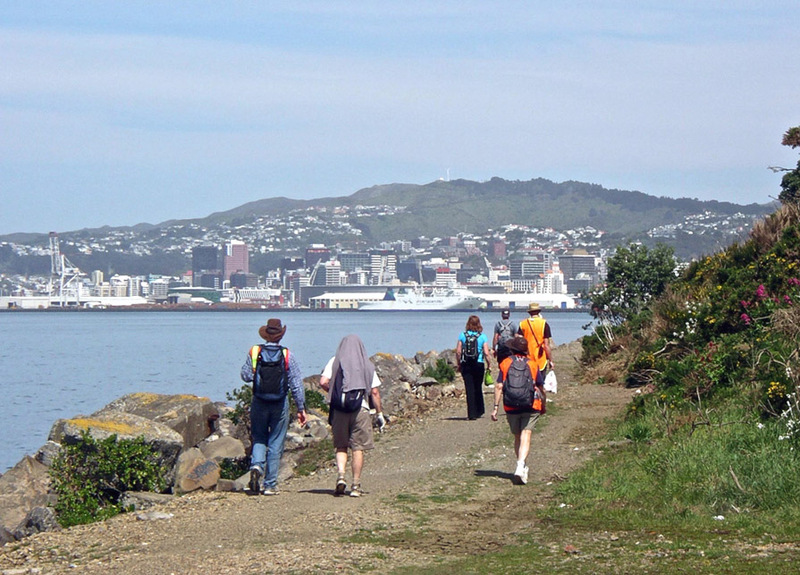 Walkers on shoreline path from Ngauranga to Kaiwharawhara – an option being considered by WCC. 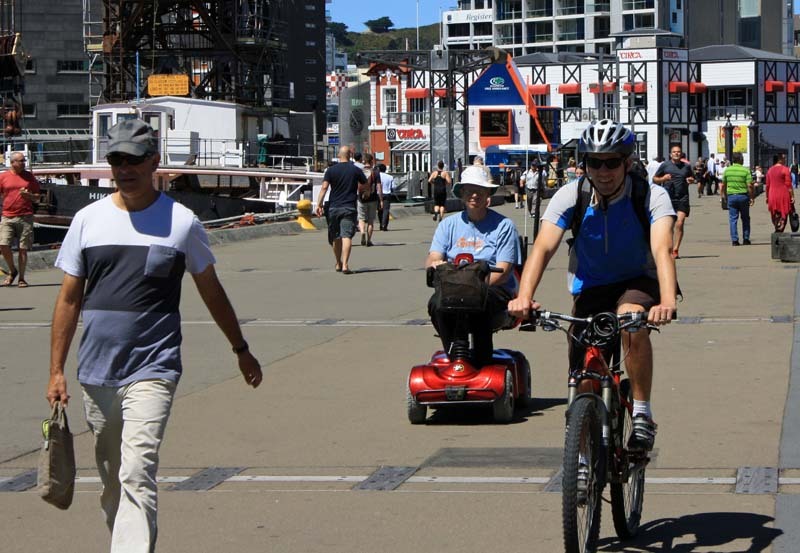 Wellington City Council is moving ahead on plans for three high grade bicycle/walking routes that will improve the Great Harbour Way/ Te Aranui o Pōneke. 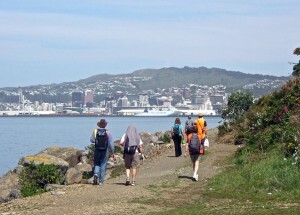 Two are part of the Great Harbour Way: Ngauranga to Aotea Quay, and Lyall Bay to Owhiro Bay. The third, Island Bay to CBD, could be an important connecting route for the GHW. At a presentation on 5 Feb 2013, WCC and Opus consultants discussed the options, particularly whether they would qualify for NZTA funding, which would be essential for the projects to go ahead. Ngauranga to Aotea Quay is of course part of fixing the Gap between Petone and Wellington. This could be by improving the existing shared path along Hutt Road, perhaps by a “Copenhagen Lane“. A more ambitious option would be a shoreline route from Ngauranga Station (crossing the railway line by either extending the station underpass, or building a shared path beside the motorway to cross at a tunnel), to Kaiwharawhara, crossing the Interislander Ferry Terminal to Aotea Quay by a cycle/walk way clipped on the motorway off ramp and then connecting to the existing shared path along Aotea Quay from the cruise liner terminal. While expensive, with imagination (and perhaps technology from the Get Across project) this could make arriving in Wellington city an iconic cycling/walking experience to rival, for example, the Te Rewa bridge on the Taranaki Coastal walkway. 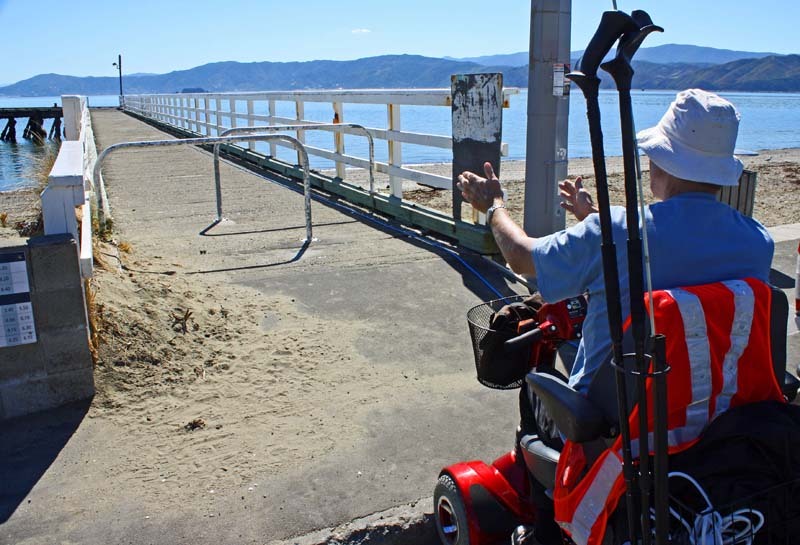 Lyall Bay to Owhiro Bay would be an offroad 3m wide shared path, saving cyclists and walkers from using the narrow, winding and relatively busy road. At Houghton Bay the path might be cantilevered out over the cliff edge, providing even better views of the dolphins and surfers. 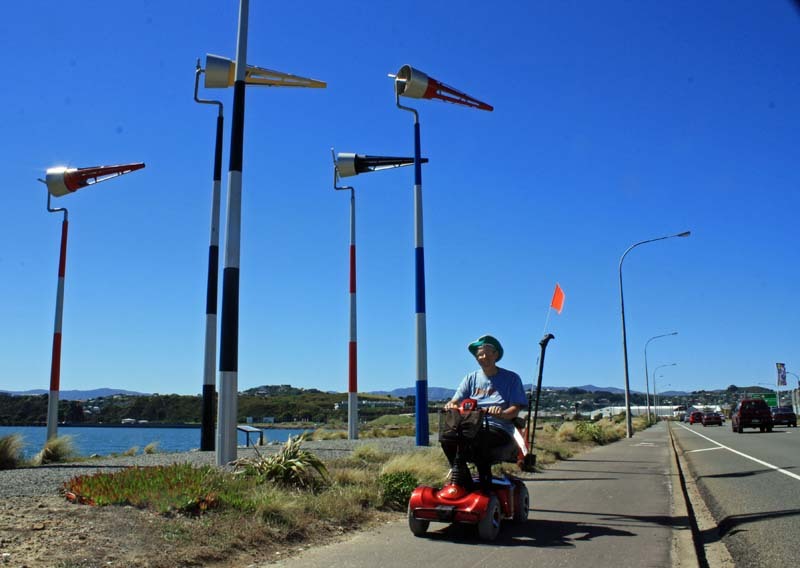 Unfortunately unless a lot of south coast residents join Wellington’s mayor in using this as a cycle commuting route to the airport, this option isn’t likely to attract NZTA funding. 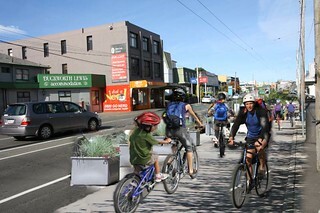 The favored project is likely to be the Island Bay to CBD “cycle superhighway”, connecting the existing cycle lanes on the Parade from Island Bay to offroad routes that would climb through MacAlister Park or Berhampore golf course, and head to the city and the waterfront along either Hanson/Tasman/Tory streets (low traffic densities but more up and down) or on Riddiford/Adelaide (better gradients and access to shops and the hospital, but more traffic). As well as attracting new commuters and NZTA dollars, this option also makes it more attractive to do a round trip on the GHW from the Waterfront around the Miramar Peninsular and the south coast, and back from Island Bay. Riding from Island Bay to the Waterfront – the future?